My thanks to the Publishers and NetGalley for a copy of this story in exchange for an honest review. Noah Spearing’s grandfather leaves him a gift which he must only open after his grandfather has passed away. Every family has its own secrets and skeletons in closets and Noah’s family is no different. His grandfather has a past that Noah knows very little about, all that is about to change when he opens the gift. Noah must decide to do what he thinks is best with the gift. Are his choices the best for all concerned? As his puts into action what he has planned to do with the gift, events suddenly take a very sinister turn. Putting not just himself but other family members in danger. I really enjoyed this book and stayed up into the early hours of the morning to finish it off as I was dying to find out what happened to them all. I found it well written and I will be looking out for other books by this Author. I feel that it would make quite a good reading group read due to the content of it and found it to be very thought provoking. Did flora fly to Poland to be with Noah or did she go for one last surf never to be seen again as she felt too much heartbreak? Did Noah’s fingers recover? Did he drive back with the wind in his locks with his beloved wife flora next to him? Did the locker ticket get recovered or was it covered in blood and disintegrated? Is the piece of art still there or did it get recovered by henryk? Did his friend in London survive and was it just words to get him to talk? How much was it to get the golf out of the multi storey car park? Perhaps another book of short stories to cover off these areas along with the first book. I need closure… Didn’t sleep well last night thinking about these issues…;-). Thank you once again. Great read. Sad to say I have come to the end of ‘On Ashover Hill’ by Anthony Scott….it’s been a fabulous read.I fell in love with the characters (all of them!) & loved the locations, the history & culture each chapter embraces. There are some great messages and hidden storylines happening within a novel which made me quite emotional (cry!) and reflect on the journey we all take in life. Living in Cornwall as I do I was intrigued when this novel, set for the first half of the book in the stunning St Ives, and a maverick choice from Guy, arrived to be reviewed. I was gripped from the first page with the very evocative description of a late Summer evening on a lovely Cornish beach (the book is full of beautifully descriptive writing). I stayed engrossed until the very last page. Centred around Noah Spearing, a young local teacher, this is the story of events following the death of his beloved grandfather (Joshua) who, with only a short time to live, gives his grandson a mysterious gift to be opened only when Joshua dies. The gift is a painting. To reveal too much more in this review is to destroy the suspense of the novel as it twists and turns towards its exciting conclusion. Suffice to say there are echoes of both the film The Monuments Men and the Donna Tartt novel The Goldfinch as the painting and the way in which it was acquired had its very own sinister history. Almost a character in its own right. The contrast between the exquisite descriptions of Cornwall and the violent scenes played out in Poland is very effective and adds to the sense that things are really not always as they seem on the surface. Secrets can remain hidden for years and then astound us when they are revealed. Part romance and part thriller, I think this is essentially a novel about love. As the action sweeps from Cornwall to London, through France and Germany and then eventually to Poland, we see various loves in the context of greed, loss, sorrow and betrayal. However somewhere in the midst of all this there is still, thankfully, a fragile thread of hope and loyalty and some bonds which can never be destroyed. This was certainly an unputdownable read, my only disappointment being that the ending was slightly inconclusive and left a few ends to tie up, but there again maybe that is all part of the mystery. The birthday gift is one of those books you instantly become engrossed in. Dreaming of the beautiful settings described and immediately warming to the key characters are unavoidable curses of this book. I think we would all like to know someone like Noah but Tess was the silent hero for me and someone I could relate to. And that’s the key here; this books gives you some loveable characters with personality traits you see in either yourself or those around you. But the characters have their personality flaws too and they make mistakes; that’s what I love about them….they’re so realistic and believable and you’re on the journey beside them, every step of the way! This is a great summer read and will have you desperate to explore the sites mentioned in St Ives or have you yearning to explore further afield. To anyone reading my review, please DO read this book. You will laugh, you will cry and you will enjoy turning each page to discover how the exciting plot unravels. Congratulations Anthony on another superb literary journey. This got a well deserved 8/10 from me. 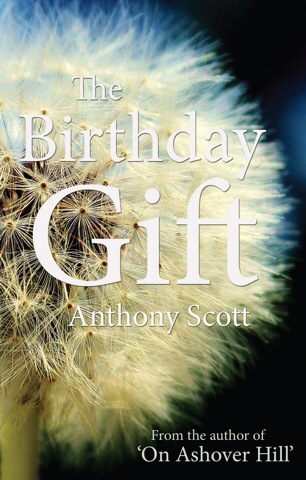 I’ve just finished reading a book called The Birthday Gift by Anthony Scott. It was brilliant. I’ve not been able to put it down all week so I’ve not been overly sociable but I would recommend reading it! Incredibly good – read it!! A gripping balanced combination of thriller and romance that’s a real page turner, but ultimately a little unfulfilling. Noah lives in St Ives with his mother Tess, grandfather Joshua, and Flora, the girl he loves. His relationship with Flora underpins the story as she is about to marry Jake. Now this is sounding like a classic romance novel, but it isn’t. 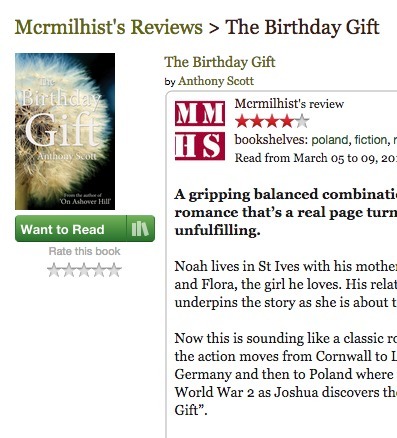 As the action moves from Cornwall to London to France to Germany and then to Poland where there’s a final flashback to World War 2 as Joshua discovers the history of “The Birthday Gift”. I really enjoyed the descriptions in this book. Cornwall and St Ives come across as idyllic places (which of course they are). The writing style is rich, which made the relationships between the characters more believable and compelling. I loved this book right up until the end when it finished….very suddenly and with too many loose ends…a real shame which is why it gets 4 stars instead of 5. 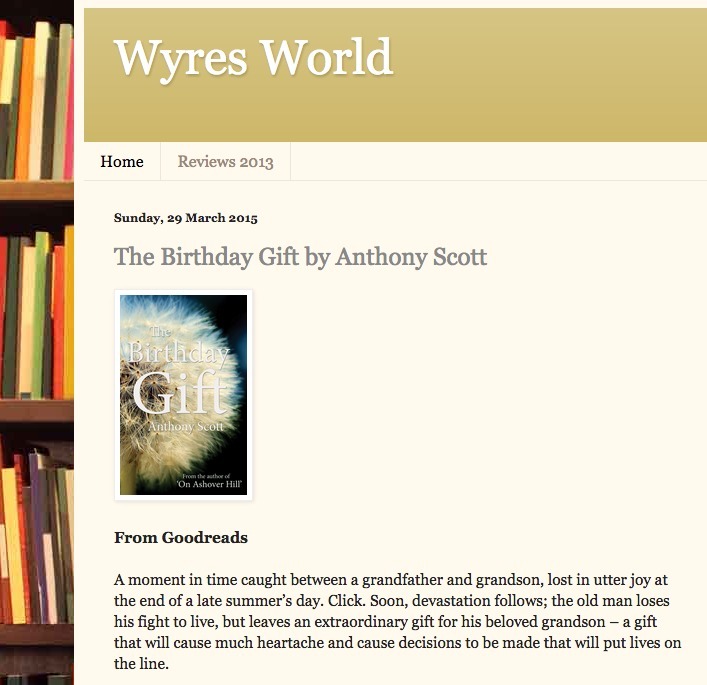 “Noah receives a gift from his grandfather Joshua who is celebrating his 85th birthday. He promises to open it after his grandfather dies. Less than a year later, Joshua dies. When Noah opens the gift, he has a beautiful painting that nearly gets him killed. The second story line is Noah’s best friend Flora, is set to marry another man and Noah has realized she is the love of his life. A moment in time caught between a grandfather and grandson, lost in utter joy at the end of a late summer’s day. Click. Soon, devastation follows; the old man loses his fight to live, but leaves an extraordinary gift for his beloved grandson – a gift that will cause much heartache and cause decisions to be made that will put lives on the line. Noah Spearing is a young man teaching in St Ives, Cornwall, when his life is changed forever after the death of his beloved granddad. A gift left for him from the man he loved more than anyone else turns out to be a poisoned chalice that he must deal with in the best way that he can. With the DVD of The Monuments Men out now this is the perfect time to be reading Anthony Scott’s brilliant tale. ‘On Ashover Hill’ by Anthony Scott was not quite the book that I had thought it would be. However, that does not detract from it in any way. I had thought that it was going to be a love story, and indeed it is, but so much more. It is the story (at first) of William McTeer, a soldier in World War II who was stationed in Naples. He meets a girl, Francesca, and is captivated instantly. He goes back to find her after the war, only to discover that her home has been bombed, and that her whereabouts are unknown. He is devastated. However, they manage to find each other, and eventually marry and have a son, Robert. Robert’s story then takes over, with William and Francesca’s story in the background. The story then moves on and is taken over by Robert’s son, Taylor. I liked the storyline very much, and loved the way that William and Francesca found each other, and lived their own personal love story. I loved the description of Naples and Florence, the sun and the beauty. I didn’t like Robert at all. He is an entirely unlikeable character, driven, ambitious, deceitful and cruel. He is not the child that I would have expected to be the fruit of the great love between William and Francesca. However, he is a very vital part of the story. Taylor is altogether different from his father, just as Robert was different from William. There is so much in this book, but behind it all, running right through the story is this amazing love affair between William and Francesca, which shines throughout. This book is amazing,it is written in chapters that span time from the past to the future. Each chapter is told from one of the characters view point. The characters are all so real that I really believed in them. There is William McTeer who meets and falls in love with the beautiful Italian Francesca. Their love story is beautiful,but not sickly soppy. There is their son Robert; who becomes the main character in the book. His best friend Angus, Robert’s children Jasmine and Taylor also have chapters to tell the story. I will not disclose the plot,as this book needs to be read and enjoyed and I will only say that I was so shocked when I read the last two lines. I was so not expecting it. PLEASE DON’T READ THE LAST 2 LINES UNTIL YOU GET THERE. If there were 6 stars this would get it . I loved every single word. 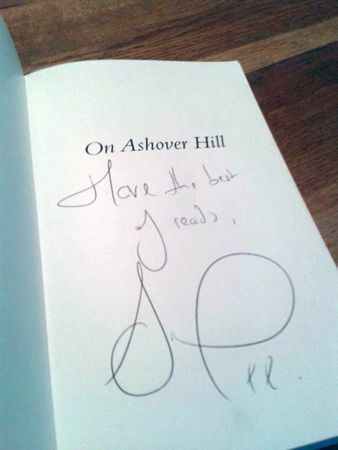 The writing style of `On Ashover Hill’ is set by an engaging opening chapter which then appears of little relevance to the main plot. This is based on family relationships and differing values over a period of time, but author Anthony Scott deliberately omits key actions and episodes as he cleverly leaves intriguing gaps in his narrative for readers to fill in the blanks. A major character is Robert as arrogant, greedy and ruthless, yet also charismatic. His most murky and shocking deeds are not described but readers are made uncomfortable by concealed collusion and conspiracy. It may be expected this would create a disjointed story, but interwoven with Robert are his parents, children, grandchildren, friends and colleagues to both admire and despise as the author introduces conflicting concepts of good and evil, love and hate, benevolence and materialism, respect and contempt, forgiveness and blame etc. 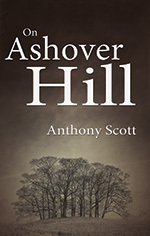 `On Ashover Hill’ is essentially a love story, but it disguises dark undercurrents and gives readers much to ponder on. Yes – the opening chapter is valid. I enjoyed this book which started with William and Francesca meeting in war torn Naples and finishes in the future, 2046. In between you see Robert, the son they have growing up in Edinburgh who turns his back on his parents values and lives by greed and a disregard for all other. Woven throughout is the family of Angus, Roberts boyhood friend and a solicitor who looks after Robert’s business interests and who suspects but doesn’t know for sure just how murky Robert’s business dealings are. Not my usual sort of book but I was intrigued with the fact it started in the future. I got caught up in the family’s lives as the story unfolded through the years. I didn’t want the story to end but when it did, it quite shocked me. A must read in my opinion. 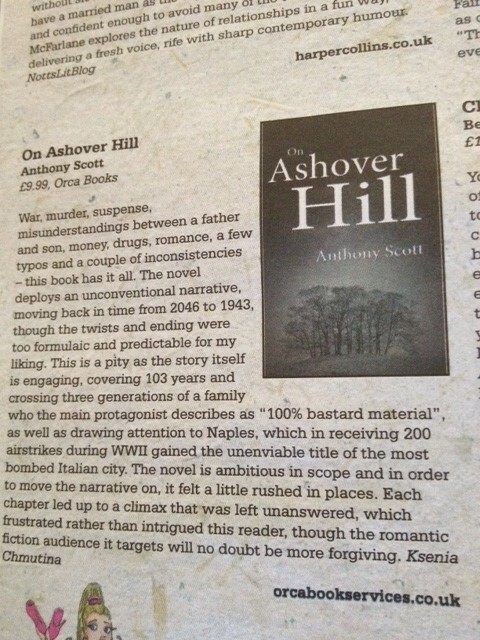 On Ashover Hill follows the story of William McTeer, who, in 1943 Naples, falls in love with a young Italian woman. The war invariably forces them apart, but as in many a love story, destiny intervenes, and somehow alerts fate into reuniting the star-crossed lovers to live happily ever after. 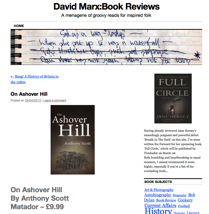 Review of “On Ashover Hill” featured in April’s edition of LeftLion magazine. AN AUTHOR from Mansfield, who has drawn on the places in which he grew up, is getting ready for a book signing in his home town. 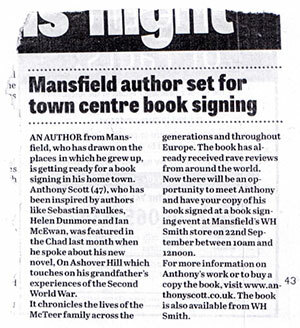 Anthony Scott (47), who has been inspired by authors like Sebastian Faulkes, Helen Dunmore and Ian McEwan, was featured in the Chad last month when he spoke about his new novel, On Ashover Hill which touches on his grandfather’s experiences of the Second World War.